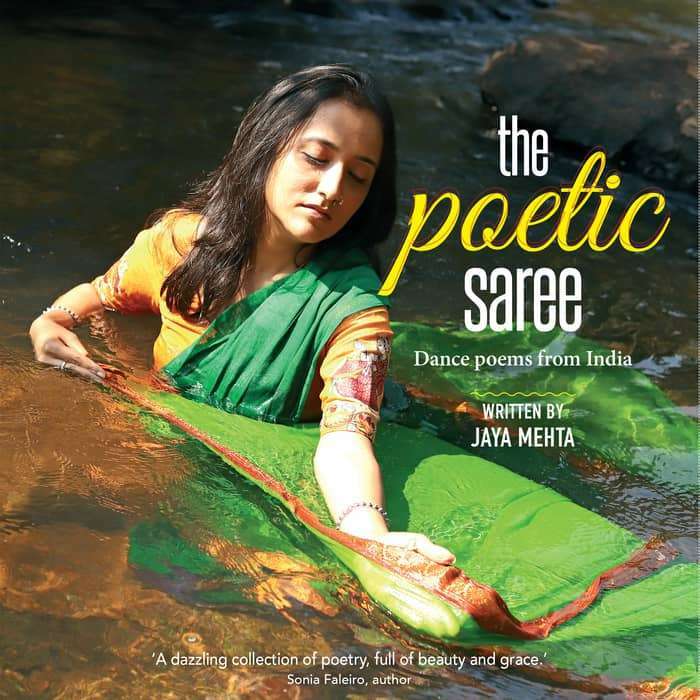 Odissi danseuse Jaya Mehta expresses her love for poetry and dance by combining the two in her book “The Poetic Saree”. In a candid conversation, she shares about her dance-poem book and her journey as a dancer and poet. What is the significance of the title of the book “The poetic saree”? Poetry to me is like a saree. Like the saree, poetry has many amazing patterns, colours and lines, the art forms of so many cultures. Both poetry and the saree wrap around us, like a whole, flowing fabric of being. 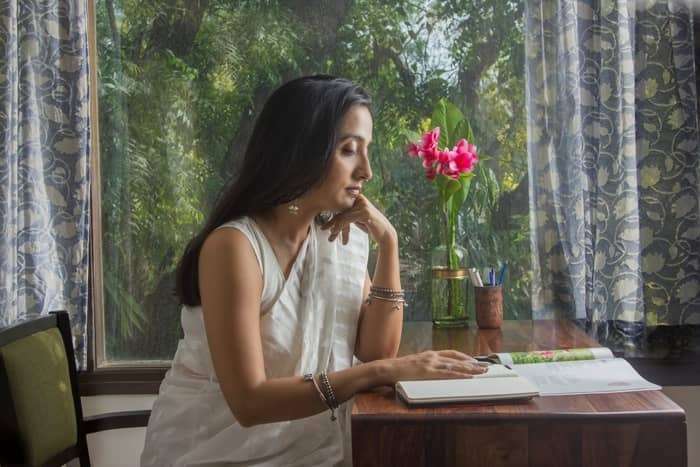 At the time of the visualization of the poetry book, I visualized the dance-poems as having the sumptuous feel of a silk saree that cascades on us and changes our experience of ourselves. The idea inspired me to visualize a unique poetry book, with exquisite dance-visuals and saree-motif illustrations. What inspired you to write a book on dance-poems? The ‘dance-poems’ are called so, because they are born of dance. 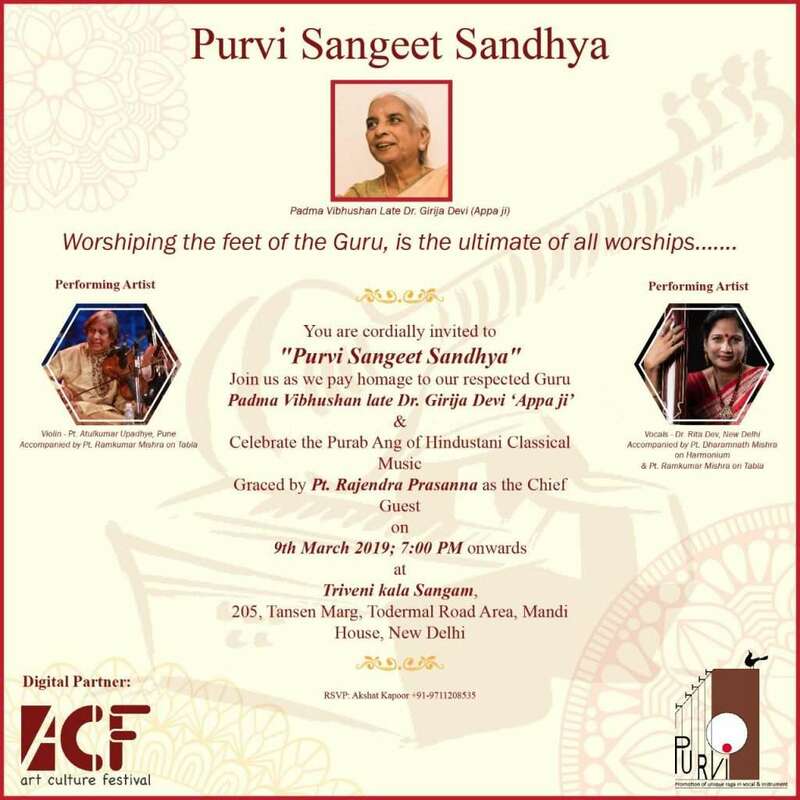 I would not have written them, if I had not learnt the beautiful Odissi style of Guru Surendra Nath Jena, imbibed from my Guru Pratibha Jena Singh. As all these incredible dances percolated into me, I found a deeper observation of my inner states, emotions and the shapes and movements of nature. In Odissi abhinaya, and Sanskrit poetry, the mango tree is a symbol of love, the first messenger of spring. It blooms into a thousand blossoms in spring, and the koel sings in the pancham note once it has tasted the nectar of the new unripe mangoes. I vividly experienced the rasa of such images in the abhinaya I danced. In my life as well, I began to see all the mango trees around me more carefully, and as this awareness increased, I found I could not see anything literally. The world looked different from dance-coloured eyes, and I saw a lot of swirls and colour and emotions in everything. As the universe revealed itself to me, I found poems pouring out of me, in this conversation. Dance lead me to this conversation, between me and the universe. The dance-poems came to me when they wished to. Only later, I decided to put them together in a book. In 2017, I danced at the International Poetry Festival in Rotterdam with Kathak dancer, Anima Jhagroe-Ruissen. We danced Kathak and Odissi solo compositions. In the end, we came together with my poem ‘Sakhi’. It had no music, and was narrated twice by each of us. It was based on my experience of the Sakhi in all Radha-Krishna abhinaya. I found that Sakhi was not a person, but our inner intuition, someone we all have, our deepest inner friend that guides, accepts and inspires us. 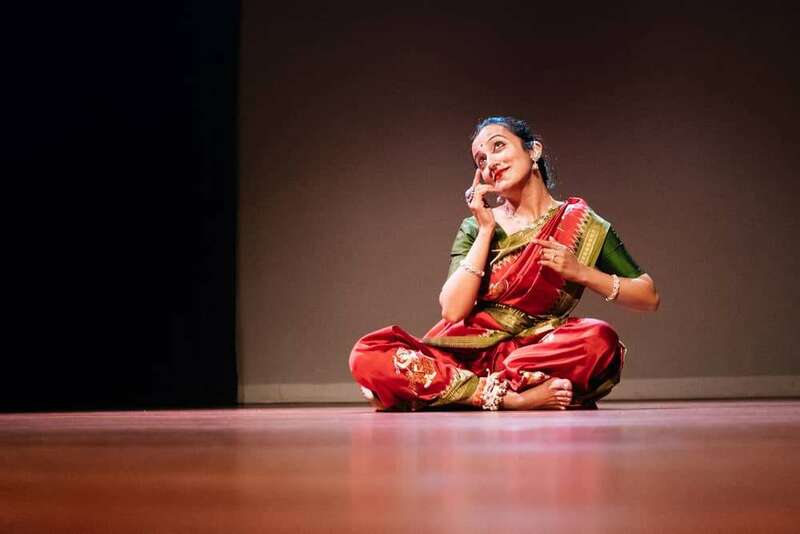 Sakhi was a big hit, and it was performed again at the India Dans Festival in Korzo theatre in the Hague. After I returned from the dance festival, I realised that the poems couldn’t just be danced. They needed to be in print, and I started work on it in November 2017. I wanted to create a beautiful, glossy poetry book with dance visuals and illustrations. I visualized it as having the sumptuous feel of a saree, and the title ‘The Poetic Saree’ came about. With book designer Swati Chakraborti and Notion Press in Chennai. Culture curator and dancer Swaati Chattopadhyay wrote an incredibly beautiful foreword to the book. In 2018, the book was published. 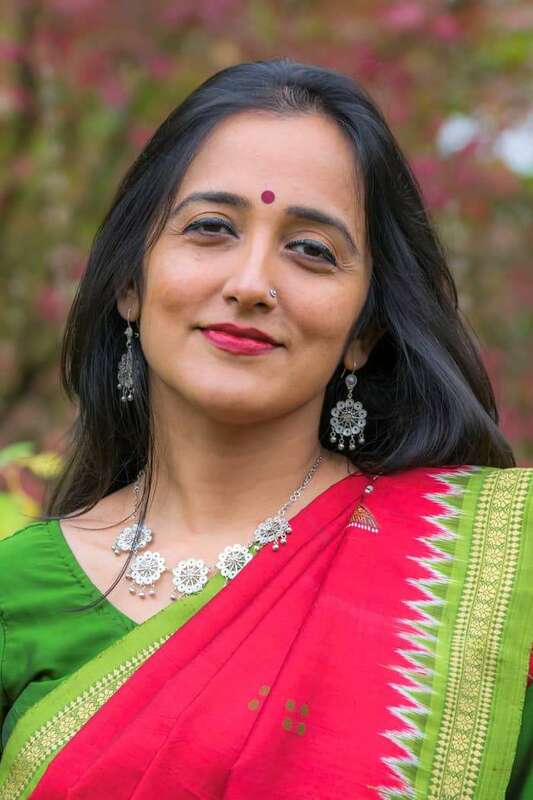 I worked further on the poems and found its new avataars: I feel poetry must be heard, and I created an audiobook of ‘the Poetic Saree’, with lilting classical guitar by Pranai Gurung in the background. The book can be heard on Soundcloud as individual poems that lighten and brighten up the day. Prior to that, five poems from the book were filmed as ‘The Poetic Saree Video Project’ by filmmaker Shabani Hassanwalia. These videos of five poems, were shot in nature-soaked locales in Delhi, and brought out the subtle nuances of each poem. They are accessible on my Youtube channel. The poems are your manifestations of your experiences in life. Please elaborate on the segments that divide the book into Art, Nature and Emotions. The sections of Art, Nature and Emotions are sections, but actually overlap each other, like they do in life. The poems in the Art section take inspiration from Indian temple sculpture, the Saree and the Sakhi in Odissi dance Abhinaya. ‘Sculpturesque’ is a beautiful poem, in which the Odisha temple sculpture is in conversation with the dancer. They mirror each other, until they are one, like beloveds. I found the sculptures in Odisha asking me once, why I had visited them after so long? What had taken me so much time to revisit them? Such was the bond I found between them and me. The poems ‘Saree and Me’ and ‘Grandma’s Yellow’, celebrate festive and fragrant in a saree. The saree is also a memory, as my grandmother’s yellow saree, reminds me of her devotion to family, and her devotion to lord Hanuman. Like him, she moved mountains through her selfless work for family. Today as I dance the Hanuman Chalisa in Odissi, and am a mother myself, I believe that I have received the gift of Hanuman ‘bhakti’ from my grandmother. Her yellow saree, sings to me these very feelings. For the Nature section, I found great inspiration in the rural landscape of Karnataka. The colossal ancient boulders near the river Tungabhadra, stunned me with their history. I experienced a poem coming out of me. The conversation the boulders and I had, propelled me to find my own ‘Boulder Being’. And that is how the poem was born. It is a poem that connects to history and our daily life struggles simultaneously, and leaves us with a spiritual resonance. The Emotions is a very deeply internal space. Its inspiration is from the inner bodily world of arteries, blood, the heart and the womb. In ‘Time to Return’ I have many doubts and questions, for whose answers I return to the womb, the womb of the goddess. Inside the womb, I am the embryo again. As fetus, I can hear the hugging darkness and the searing melody. Only when I reach to a point of deep observation, I begin to see the rhythms of the goddess, and my worldview changes. This brings me to a new dawn in the poem ‘Return’, where life has new meaning, as I have reached the calm centre of my being. Which is your favourite poem in “The Poetic Saree’ and why? My favourite poem is ‘Return’, the last poem of the book. After all the meanderings of life, the conversations and questions, doubts and joys, I go back to my deepest innermost Self in the ‘Return’. I trust the play of life, the rhythms of the goddess. In that return to myself, I find that I have unlocked many locks. As I weave them into a ‘garland of lights’ I return to my space of deep peace and quiet within my innermost self. 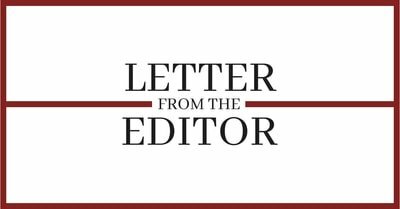 Since when you have been writing poems and what inspired you to write poems? I wrote these poems since perhaps 2015. I wrote poems as a child, but stopped writing as an adult. The beautiful and immensely spiritual Odissi style of my Guru, enhanced my understanding of the poetic nature of the universe. I realised that poetry is soft and floating, powdery like snow, elusive. It exists all around us, but we can access it only when we have a lateral and not frontal view of life. When we engage in any spiritual practice, we can see the poetry around us more clearly. To express it needs an art form, and I have been blessed to have dance. 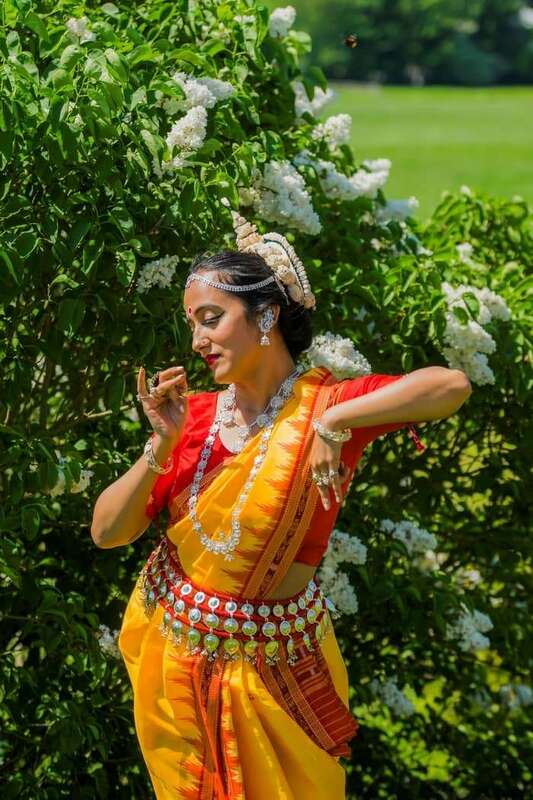 Please share your Odissi dance journey. Temple sculpture brought me to Odissi, as found the sculptures to be dancing in Indian classical dance. I wanted to experience the dancing sculptures, their lines and feeling in my body, and that is how I took to dance. I left my job and my education in Painting, to dance. I did not know where it was to take me, but I just knew I needed to experience all these sculptures in my being. I found the Odissi style of Guru Surendra Nath Jena, which is a virtual encyclopaedia of Indian aesthetics and spirituality. From Upanishads to temple sculptures, Geet Govind to miniature paintings, jatra theatre to the Hanuman Chalisa; I found it to mirror so many brilliant art forms and emotions from our daily lives. My Guru Pratibha Jena Singh, always reminded me that this dance style was primarily for prayer and not performance. It is this dance-prayer that rejuvenates me and has become my daily sadhana. From this churning, the dance-poems have come, and I thank the almighty for these blessings. What is the most beautiful part of combining poetry with dance? In my life journey, Poetry is the daughter and Dance is her mother. Both mother and daughter resemble each other, are born of each other, behave like each other, yet have their own personality. The dance gave birth to the poems, and now they are becoming dances again. It is a cyclical relationship. Poems that are born out of dance are very strongly visual and exploding with colour and emotion. It was but natural that they became dances again. Like a daughter often resembles and becomes like her mother, without trying to do so.